Stop by to learn everything you need to know about improving your health without painful injections, medications and unnecessary surgery! Sessions run from 8:30 am – 2 pm. Join LAURA ARNOLD for an Achieve Body workout! This class is never the same class twice, this is a mash-up of your favorite cardio and strength training moves for a full-body workout. HEALTHER WALSH PT, DPT will present on low back pain and how physical therapy and at home tricks can help you get back to living pain free! Join KATHRYN RAND for a CRUSH workout! This is a fast-paced and fun, this circuit class features cardio, upper- and lower-body strength, and core work in 1-minute segments. 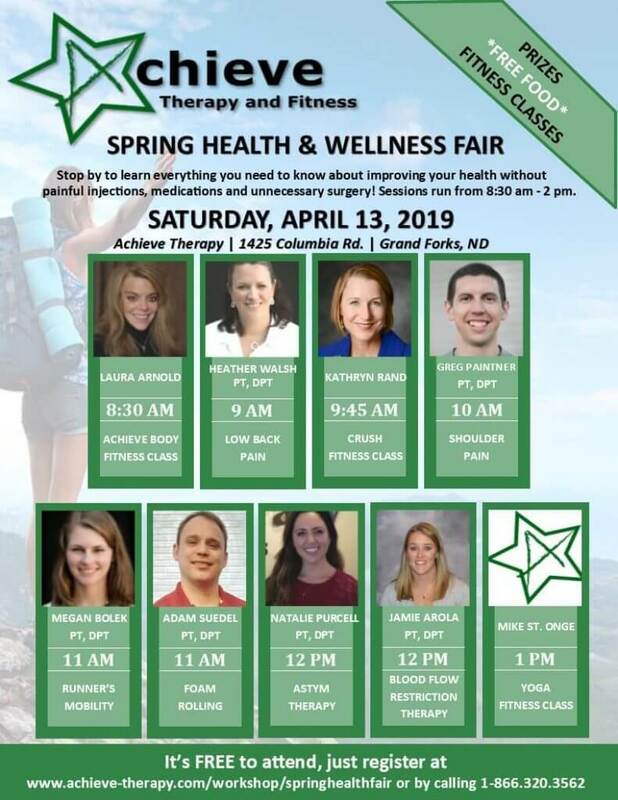 GREG PAINTNER PT, DPT will be presenting on shoulder pain, what it is and how physical therapy and at home exercises can help you get back to living pain free! MEGAN BOLEK PT, DPT will be presenting on runner’s mobility. Gearing up for a spring marathon? You won’t want to miss this session! ADAM SUEDEL PT, DPT will be presenting on foam rolling. What is it? How do we use the foam roller effectively? How is it beneficial? If you’re not using one, you should be! NATALIE PURCELL PT, DPT will be presenting on ASTYM therapy. Astym is a treatment used to jump start the body’s natural inflammatory process necessary for healing – come find out more! JAMIE AROLA PT, DPT will be presenting on Blood Flow Restriction Therapy. BFR helps build muscle strength and volume, using less intensity and resistance – especially days following injury or surgery. Join MIKE ST. ONGE for an invigorating YOGA workout!